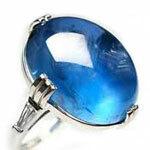 Blue Sapphire's governing planet is Saturn. It is a gem of Makar& Kumbh rashi. 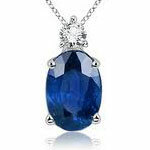 Every person is frightened when the name of Blue Sapphire comes in his mind. Neelam shows quick effects to the wearer. 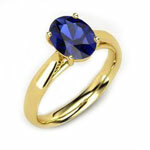 When person falls on in despondent then Blue Sapphire is the only gem which can spread light in life. The rectitude on Judgement turns out after this is worn and it is virtuous gem. It is also cold gem. Thousands of people have turned wealthy from pauper of its facile aspects. This gem is expedient to be worn at the time of Saturn Mahadasha.Studded in Gold, Silver or Ashtdhatu(8 types of metal). In case it is favourable to the wearer it destroys all his ills, poverty & distress helps to regain his lost property. Cures his diseases and make him wealthy & prosperous in all respects. It is regarded as a lucky stone for lovers. But in case the wearer has bad & unhealthy thoughts it will give unfavourable results. 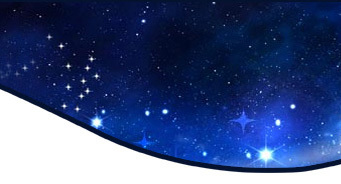 If your Saturn planet is unfavourable you will be liable to face with a number of difficulties & diseases like asthma, nerve weakness, paralysis, epilepsy, cancer, softness of brain, insanity, hiccups, hysteria, neuritis, pain in the joints & mental diseases. You will loose money & your friends will become foes. You might be entangled in legal cases & can be sent to prison too. Note: Before wearing consult your expert Astrologer or Palmist.